Gosh, it's been so long since I posted that I really don't know where to start (and stop)! When I last posted, I was getting ready to leave for the I-80 shop hop in Clear Lake. It was lots of fun and I even got to meet a fellow blogger. Vivian, from Quilts N a Mug (sorry - blogger is not letting me post a link to her blog!) came to see me. Wish we would have taken a picture together, but of course, I didn't even think of it. It was so great to meet her in person and chat for a few minutes. I did actually take some pictures of my booth. I had a big space to fill, so I took some of my friend, Missie's (Traditional Primitives) quilts and patterns to sell. Boy, her awesome quilts sure made my booth look good! The pineapple on the wall, in the center of the picture is hers, as are the two on the table below it. You can see my jewelry displays - these are working out really well - they are old window frames that I got from a friend. This beauty is also Missie's - it's her newest design and is called Pennies in My Garden. I love the whole thing, but especially the flowers in the borders. I told her she was nuts for letting me borrow this - and that she would be lucky to get it back! I actually hung it on my design wall after I got home. But, it finally made its way back to her. The quilts hanging here are my design - actually the first pattern that I published. I made the big quilt, then had one of those middle-of-the-night ideas that I should try making it smaller. Love the little one! The quilt hanging here is my tiny 9 patch, called Size Does Matter - it is much better in person than in pictures - the 9 patches finish at 1 1/2". I sold almost all of my pin cushions at this show. One super-nice elderly lady purchased eight or nine of them to give as gifts for Christmas. It really was a fun show - my neighbor was Merry Backes from Merry's Stitchins (what is the deal with my computer? won't let me post a link to her either! )- she has an amazing shop in Jesup, IA. I had been there a couple of times, but it's been several years. She invited Mom and I to stop on Sunday on our way home, and boy were we glad that we did! She recently built a brand new shop, and it is amazing! it's huge, and she has everything you could ever want in there - even wool and Valdani floss! I'm hoping to spend some time with her, maybe this Spring. She has a retreat center there as well - it is in her old shop. It would be a blast to go and stay for a few days...or a week! After vending at a couple of shows, then selling to a few of the vendors for their shops, I am really, really low on jewelry. Of course, the first priority is keeping up with the charms - the batch you see below were sent out the end of November, and I've been working away on the next ones. And in between that, I've spent a few weeks in Des Moines with my daughter. She and her boyfriend have been here some too - so nice to have her to help decorate my trees. The boys (my husband, Greg and her boyfriend, Greg - we call them Team Greg) had to work on the lights on the trees for quite some time, and my Greg has vowed that this is the last Christmas we will have that tree! To prove his point, he burned the box! Surprised he didn't have a ceremony when he did it - he's been mad at that tree for several years! We will have a very small crowd here on Christmas - my brother and his family are at their home in Florida for the holidays, which makes it pretty quiet around here. We were supposed to have our annual cookie bake yesterday, but we've had freezing rain and there was a layer of ice on everything - so Mom stayed home and made cookies by herself - :(. It's no fun to have to make them all alone! Jessica and I made a ton of peanut clusters and some round pretzels, with white chocolate in the middle with an M&M on top (should have taken a picture! )- but that was it - we just did the easy stuff. Poor Mom was home making anise cookies and all the hard stuff! I told her to get Dad to help, but she seemed to think going it alone was a better idea! Overnight we had about 5" of snow - we will definitely be having a white Christmas! I hope you all have a very Merry Christmas, and a Happy New Year! Enjoy the time with your family! Friday, November 15th - 10:00 a.m. - 5:00 p.m.
Saturday, November 16th - 10:00 a.m. - 4:00 p.m.
Do you all remember Lil' Punky? I have just a few kits left for this pin cushion, and I will not be making any more. If you are interested please visit my website. The cost is $14.95, which includes the pattern and the kit. Are you all on Facebook? I have a personal account and a "Me & My Stitches" account - I'm hoping to get more Likes and then will start posting on there more often. So, if you are on Facebook - please go Like my page! You never know, we may have a Facebook giveaway if we get lots of followers. We had an inch of snow yesterday here in Iowa. I thought it would only be a few flakes, but it really came down. It seems way too early for snow, but they said on the news this morning that we had an inch of snow on the ground last year at this time too. Maybe it's Mother Nature trying to put us in the mood to listen to the Christmas music already playing on the radio, and the decorations already out in stores! I don't know about you, but I want to celebrate Thanksgiving before I think about Christmas! I sold a lot of pin cushions in Lee's Summit last week, so I've been making up some new ones, and have a few more yet to do. I also forgot to mention that a customer brought me the best scrap bag! I would love to see the quilt that she made with these fabrics, because they are all awesome - not a bad one in there. I don't know why, but it's always so much more fun to play with someone else's scraps - I've been using them all week to stitch an order for a new customer who has a shop in Louisiana. Such fun - new scraps and a new customer! 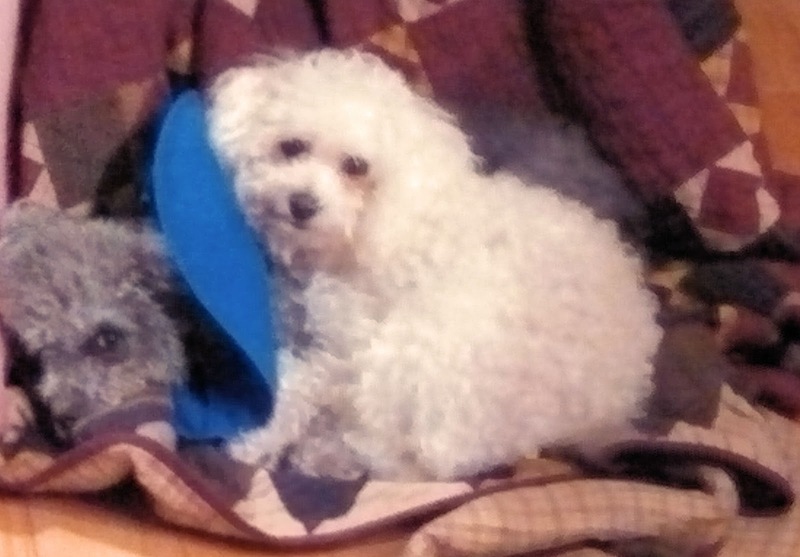 Speaking of scraps - there was a huge loss to the quilting community last week. I met Cindy Hathaway when Fons & Porter published my jewelry in their magazine "Love of Quilting". She and some of the girls from F&P started sending me amazing boxes of scraps, and I remember Cindy saying that she would never look at her scraps the same again - and she just couldn't stand to throw away smaller pieces, knowing that I could put them to good use. It was always so much fun to get a box from them. Sometimes I thought she put some bright fabrics in there just to challenge me to see if I could use them. I always had fun making things with those brights and sending her pictures (to show her that I can sew with brights when challenged!). Unfortunately Cindy lost her year-long battle with cancer last week. I will miss seeing her posts on Facebook - she was always so positive and such a happy person. She will be missed by so many people. Please keep her family in your prayers. I can't have a post without an animal picture..
As you can see, Boomer and Dottie have bonded! I'm home from Kansas City, and the Lee's Summit quilt show was great in so many ways! First off, they do a beautiful job displaying and hanging their quilts for the show. They have a huge pipe and drape set-up and the drape is all black, which just makes each quilt show so well. They also do a great job of taking care of the vendors. Everything is so well organized and they provide tax info, food and drinks, and even had someone there to hold the door open while we carried everything out after the show. So helpful! The next show is in Clear Lake, IA on November 15th and 16th. But first...I head to Des Moines later this week to see PINK in concert!! I am sooooooo excited about this. I've wanted to see one of her shows for a long time and was finally able to get tickets. My daughter and I will be having a blast at the concert! Can not wait!! Will be back next week with more info on the show in Clear Lake! Kansas City, Here We Come!! Friday, November 1 - 9:00 a.m. - 5:00 p.m.
Saturday, November 2 - 9:00 a.m. - 4:00 p.m. If you are in the area, come to the show - it will be fun for sure! This would be a great time for a little road trip - gather your friends! As I am rushing around trying to get everything packed and ready, this is the help that Ozzie is giving - he just can't resist a pile of quilts (I mean, really...who can?). And outside...Boomer and Dottie are just hanging out together. They really are a cute pair! She feels the need to hold down this pile of fabric! I better get moving - still have to pack my clothes! Hope you have a great weekend - come and see me at the show!! It seems like forever since I've posted - it's been busy around here! First we were finishing the first charm for Charming 2 - this shows about half of them. 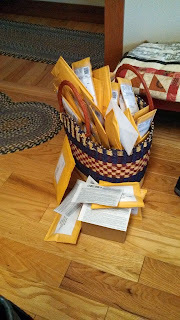 And here they are, waiting for Marty the Mail Lady to come and take them away! These are from Barb of Fun with Barb blog. When she found out that I like homespuns, she sent me all of these! They are more than scraps - that red piece (my favorite color!) is yardage! Fun! Thanks again Barb! And you remember the Not So Ugly Quilt...I finally got together with the recipients of this quilt - we met for lunch one day. 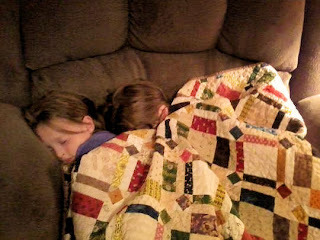 Nicole sent me pictures later that night - seems they like the quilt! I loved giving this quilt to them because they really appreciate the time and love that goes into it. Here are their twin girls snoozing under it. 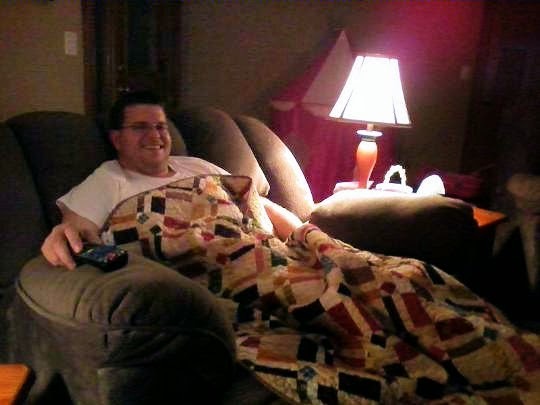 Yep...Joe stole the quilt. Not sure if she ever got to use it or not. But, I'm so, so happy that they like it (and didn't think it was at all ugly!). Next I was getting tons of quilts packed up for a trunk and had lots of help, as usual! Just watching! But, then she decided to hop in with my clothes too. Thank goodness for lint rollers! That just makes me laugh. He obviously needs to learn some manners! Nothing like letting it all hang out! DH went to the trunk show with me and helped set everything up, played Vanna (held up all of the quilts while I yakked about them) and helped pack back up. Then we loaded all of that into his van - he took everything home and I went on to Des Moines where I worked in the Primitive Gatherings booth during the AQS show! What fun that was! I'm not used to being on my feet all day, so it was definitely exhausting, but it was a blast! We had a display of my jewelry there and a huge booth full of awesomeness. I wish that Lisa would design something ugly just once, so there would be one thing of hers that I didn't want to make! She brought the pre-cuts of her brand new fabric line, Floral Gatherings, so of course, I had to bring home a bundle of that. And one little kit made it's way into my bag as well. I think that was pretty good, since I was surrounded by all of it for four days - it was really difficult to pick just one. I didn't have much time to check out the rest of the show - we did walk around a little one day before everything was open and took a peek. I also had a chance to see some of the quilts of the Des Moines guild. They are a very talented group - so many amazing quilts. It was a really fun week - I stayed with my daughter (but didn't get to see her very much!!) and rode back and forth each day with Missie from Traditional Primitives (be sure to check out her blog for some pictures of a few of the quilts). It was nice to be able to spend a little time with her! Now I am back home and trying to get caught up - I finally got my laundry finished and all of those quilts put away. Now I am focused on the next show, which is in Lee's Summit, MO on November 1st and 2nd! A fun new book is on the market! I'm so excited - have you seen the new "Best of" from Fons & Porter? It is all paper pieced quilts. Now, I know that not everyone loves to paper piece, but it's my life! And, I'm lucky enough to be a part of this great new book! There are tons of really awesome patterns in here - definitely something for everyone. My Pineapple Punch and Flag Fanatic pin cushion patterns are both in the book! It is a Leisure Arts book and is brand new on the market - my copy just came last week. 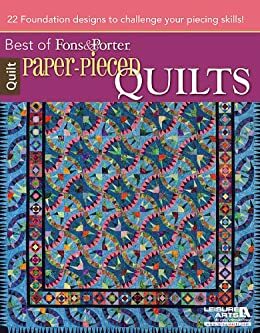 So, be sure to check with your local quilt shop to see if they have this one on their shelves, and if not - you can find it on Amazon! Quite awhile ago, I started showing my pieced tops as finishes - a kind of first-stage finish! I decided that if I didn't show you then, you might never see them. BUT...I actually have two more finishes...FINAL FINISHES! Bindings done and everything! The first one is Gathering Baskets, by the Woolen Needle, in Williamsburg, IA. The second is Dancing With the Stars by Planted Seed Designs. I bought this pattern and kit at Country Sampler, in Spring Green, WI last year. I'm excited to have them both finished! They were machine quilted by Kym Ward of Reds Threads. I wish you could see the quilting - she did an amazing job! 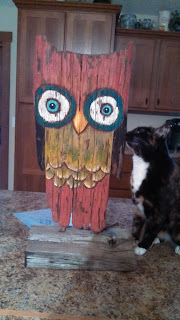 Speaking of amazing...check out my new owl! I just love him! 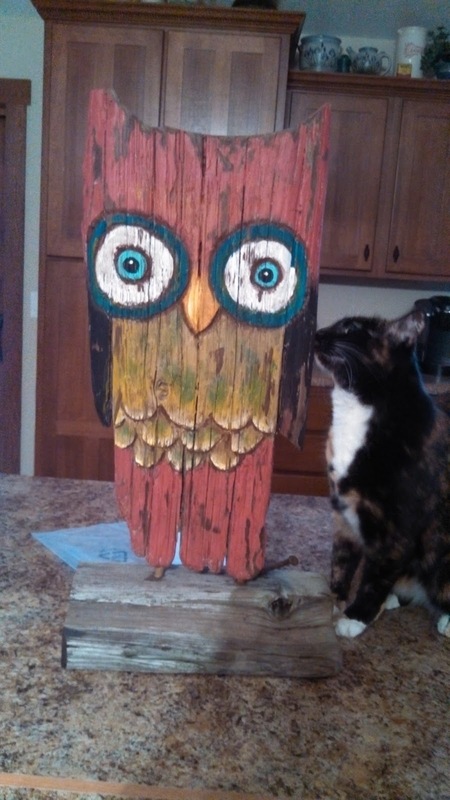 He is made from driftwood, and I think Callie approves! This is a creation of Laura Benge, of Whimsy Creations. She makes a lot of really awesome stuff, which I get to see in person next Saturday at the Des Moines Farmer's Market - really looking forward to that. Here are a few new pieces of jewelry that we finished awhile back. Sorry about that big ol' glare. Maybe someday I will learn how to take better pictures, but don't bet on it! I've talked about Kim from Kimmykats blog before, but you've got to go see what she has done now. Last fall when we got together and went to Junk Jubilee (also in Des Moines) she bought a couple of my pendants. I knew that her plan was to add her own touch to at least one of them, and now she has done it. I LOVE IT! She is so talented. I'm hoping she will teach me a few of her tricks (she could teach me a thing or two about photography too!). He has such a rough life! Have a great Labor Day and a wonderful week! Do you remember the quilt that I was working on that my husband was less than thrilled with? He is smart enough to not come out and say it's ugly, but I think that is what he thought! I think his comment was..."it's kind of bright"! I guess he is used to seeing all of my projects in dark fabrics, so maybe this was just a little shocking (trying to give him the benefit of the doubt!). Anyway, the quilt is finally finished and ready to go to its new home. Not ugly at all! I kind of like it, even if it is brighter than my norm! A New Baby in the House! Who would have thought that at my age I would have a new baby? Haha - nobody would have thought that, that's who! Some of you probably think that I broke down and got a new kitten. But no...Callie and Ozzie are plenty to handle right now. So just who/what is the new baby? She's a beauty, that's for sure! A new Viking! And it's RED!! My favorite color...how could I resist? I love my old Viking machine - it's a Quilt Designer, and I would never give it up. But...I gave into temptation and bought another one! I looked at this machine a few months ago. It is a Tribute 140C - and is a 140th Anniversary model. The anniversary was last year, which means that I got a good deal on this machine. I really had no intention of buying another sewing machine, because there is nothing wrong with mine, and I really do love it. In my opinion, Viking machines have some amazing features that just aren't available with other brands. The sensor system is one of them and it sure makes my life easier when I'm piecing tiny jewelry. No presser foot to be constantly putting manually up and down. It is all automatic, you just push on the gas pedal and go! Another thing that I like about the newer Vikings is that all of the stitches are built in. My other machine uses stitch cards, which I recently found out do not last forever. The card with the 1/4" stitch no longer works, which is why I was visiting the sewing machine store in the first place. I can still stitch with 1/4", it's just not as convenient as it was when that card was in working order. By the way, I bought this machine in Burlington, IA, from Alice at the Sew N' Sew Shop. She has taken really good care of me and my machine over the years. I couldn't wait to get home and play with my new toy. It is really very similar to my old machine, but there are a few buttons in different places, which takes a little time to get used to. Now I want to make something to use some of my fancy stitches, but not sure what that will be yet. The pieces below are made from Glory Gatherings fabrics by Primitive Gatherings. I've had a bundle of these fabrics for awhile, but just hated to break into them - they were such a pretty stack! Does anyone else do that? Geesh - I buy them to use, not to look at! I do really like how these turned out. I love a good stripe! That's all for now. I have some quilts to show you, but will save that for another day! That sums up my life - what's going on with you?? Have a great day! (We are currently having a nice, soft, much needed rain here in Iowa!). Many of you probably have already seen the blogs of Missie (Hallbrook Designs), Kathy (Kindred Quilts). and Carolyn (Lee Prairie Designs) - so you know about our super fun road trip on Saturday. Well, as usual...I did not take pictures (told Kathy I would be "borrowing" some of hers!) - so please go check out their posts to see some inspiring pictures of the shops we visited. We met at The Woolen Needle, in Williamsburg, IA. I hadn't been there for quite awhile and was pleasantly surprised by the changes they have made there - they opened up one of the back rooms so the shop is bigger now, and they also moved things around and it just seems a lot more open and lighter than it used to. It's such a great shop - they have SO MUCH WOOL! Of course, a big pile came home with me. I forgot to take a picture (shocking, I know) of my wool purchases, but I re-organized my stash closet and got my wool all stacked nice and neat (it was just all piled together before) - so I will show you a picture of that. The first one is a basket of smaller pieces - aren't they pretty? Here are the 2 stacks of wool, with the basket on top. My wool stash is growing! This is a box full of recycled wool - some of those in the back are the ones I played with on Kool-Aid dye day. Not only did I shop hop with friends on Saturday, I also ordered some wool online last week from The Old Tattered Flag - aren't these nice? 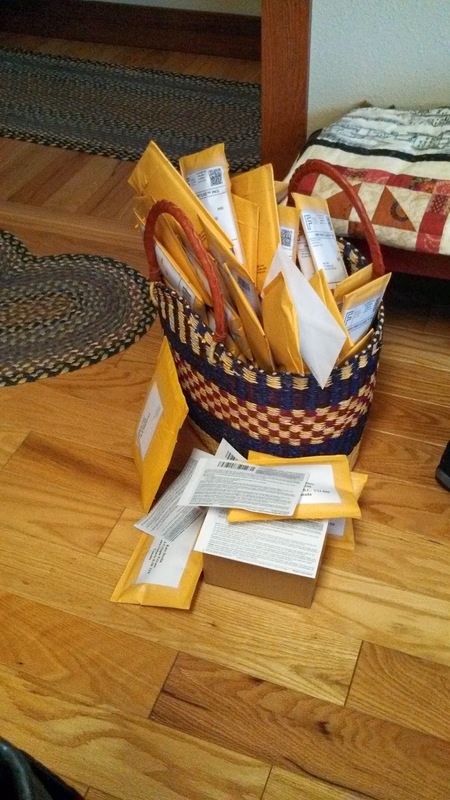 And the patriotic ones came in that nice patriotic basket. Gotta love those reds...and stripes - I am on a stripe-kick for sure. You can't really tell from this picture, but I already hit the light/red stripe with Instant Antique and it looks awesome. And some blacks (and more stripes!). When I make jewelry using the log cabin design, I love putting in a stripe or two - I just think it adds a lot of interest. And some blacks with a little color (and what could be better than red?) also spruces them up. See those little stripes, checks and interesting prints? I think they really add to it. Lisa gave me this little kit at spring market last year and I never got around to putting it together. Well, after some taunting from Janet O, I decided (on the 4th of July) that I needed to work on a little patriotic quilt! It probably won't get quilted for awhile, but it's hanging on my design wall so I can see it. I watched (on her blog) as she made this and was just amazed, and asked her to bring it. All I can say is WOWZA!! It is so, so cool. I really want one...tried to steal this one...but she had her eye on me! I'm hoping that she decides to teach a class on it, because I will be the first to sign up. It is just amazing! Love this little table topper and it's my favorite colors - just perfect! She also gave us a spool of Aurifil thread and a General's marking pencil - again...just perfect - I will definitely put all of these things to good use. We really did have a great day - it all went too fast - can't wait until we can get together again! Don't forget to go back to the top of this post and follow the links to the other blogs - there are pictures of some of the shops - major eye candy! !